City Express doo is the leader in delivering shipments on the principle „from door to door in 24 hours“ on the territory of Serbia. 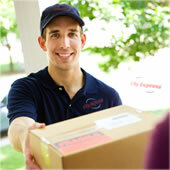 The company was founded in 2002 in Belgrade, as the first private company that deals in courier shipment delivery. Expansion and speedy development during the first five years of work was made possible by logistic support made of 340 vehicles, 500 employees and presence in 16 centers on the territory of Serbia. The City Express business has offered the users of courier service on the Serbian market a fast, simple end economic solution in the area of shipment delivery to the physical as well as the legal entities. The City Express development has been noticed in the international business circles. In November 2007, City Express became a part of the Austrian Post, division for packages and logistics. It is the first and only shipment delivery company in Serbia with 100% foreign capital participation. Complete change in the way of operation, with significant increase in services quality, the Austrian Post had achieved through serious investing with complete automation of all company sectors. Logistic software, electronic tracking of shipments, and conveyer belts have raised the service level and made it possible for 97% of picked up shipments to reach their destinations within 24 hours, and thus opened the door for implementing new services: Crossborder and Outsorcing. We strive to follow up to date world trends and add our innovative approach, to raise the quality level of our services, and consequently the quality and level of business of our clients. International experience, young and energetic team of workers, strong IT infrastructure and long term tradition of the owners are ensuring the fulfillment of our clients’ expectations and needs.